We have created a special plan for each type of web site. The Starter web hosting Plan for new web sites to keep your costs low, and the affordable plan for all your web site needs. At WebRiz Hosting, it is our goal to present advanced and easy-to-use web hosting solutions. Our state-of-the-art Web server, fiber network and highly skilled hosting experts will ensure that you receive a powerful and reliable hosting experience. Our Servers are configured with RAID and have backups daily, weekly and monthly. Backups include all web pages, databases, emails and website settings. If you desire a low cost web presence that offers superior performance and reliability, WebRiz Hosting has the hosting solution for you. The best technology, the greatest features. Learn more about our Web hosting plans. 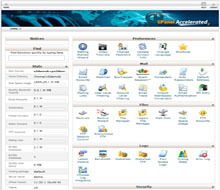 Award winning Cpanel Control Panel offers maximum features. Complete control of your website and Email accounts. No other Control Panel offers so many features. You have total control over all aspects plus easy to understand help screens to guide you on things you may need help with. All the top rated free scripts from our Softaculous script installer is available to give you quick and easy setup. For a full list of available application plus previews of each click on the link below.